Item Description: “An Improvement,” (editorial), The Daily Journal (Wilmington, N. C.), 18 June 1864. 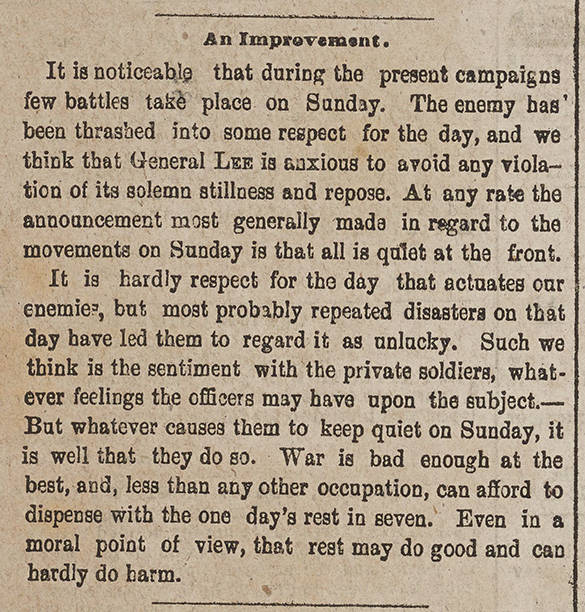 It is noticeable that during the present campaigns few battles take place on Sunday. The enemy has been thrashed into some respect for the day, and we think that General Lee is anxious to avoid any violation of its solemn stillness and repose. At any rate the announcement most generally made in regard to the movements on Sunday is that all is quiet at the front. It is hardly respect for the day that actuates our enemies, but most probably repeated disasters on that day have led them to regard it as unlucky. Such we think is the sentiment with the private soldiers, whatever feelings the officers may have upon the subject. But whatever causes them to keep quiet on Sunday, it is well that they do so. War is bad enough at the best, and, less than any other occupation, can afford to dispense with the one day’s rest in seven. Even in a moral point of view, that rest may do good and can hardly do harm. Item Citation: “An Improvement,” (editorial), The Daily Journal (Wilmington, N.C.), 18 June 1864, page 2, column 1. Call number C071 W74j, North Carolina Collection, Wilson Library, University of North Carolina at Chapel Hill. This entry was posted in North Carolina Collection and tagged Sundays, The Daily Journal. Bookmark the permalink.